A Baby Diaper Cake with Wonderful Color! This vibrant & colorful baby diaper cake will give you dozens of cute diaper cake ideas for your own baby shower creation! I love all of the color combinations and the pretty bows on top. What a creative work of art! Lynn submitted this wonderful diaper cake for us to enjoy. She has also included some VERY helpful hints on making a diaper cake. If it weren't for creative & caring readers like Lynn, this website would be far less an inspiration to all of you who come here looking for cute ideas. We have the very best readers on the web who truly go the extra mile to submit their ideas to help the rest of us. 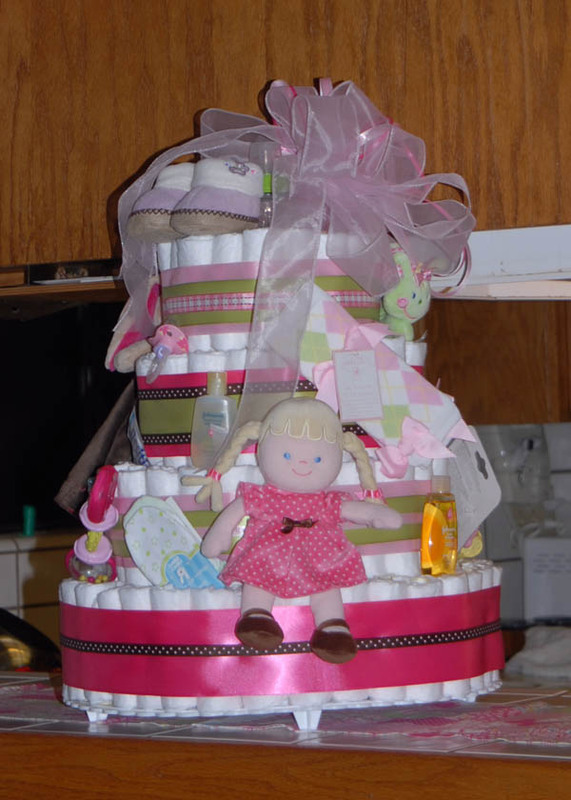 So a big THANK YOU to Lynn for sharing her adorable diaper cake! Would you like to share your diaper cake ideas, pictures and/or instructions? Submit them here ! Making this cake was so much fun. I used approx. 200 size 1 swaddler diapers, rolling each one with small clear baby hair ties. Make sure you roll the diapers tight. After I rolled the diapers, I put a baby bottle in the center of a cake plate and started placing diapers around the bottle securing them with a large rubberband. Keep doing this until you get the desired layers you want, using baby bottles for the center support. It is important that every layer is tight so that when you apply the ribbon and accessories the diapers don't shift. Once I had the desired number of tiers and size of the cake I wanted I then wrapped the outside of each tier with ribbon, using matching colors of ribbon to the accessories that I was going to put on the cake. Once that was done I places on the accessories using glue dots to secure them. The accessories I used for this cake were: Bunny snuggle buddy, My first doll, baby rattles, mittens, baby leg warmers, booties, brush and comb, pacifiers, and travel size toiletries, topping it off with a bow on top made with wired ribbon and 2 other matching colored ribbons intertwined. It was the hit of the party and my Niece wants to keep it forever. Have fun and enjoy the reviews. What a diaper cake, Lynn! Such a delight!! If you liked Lynn's diaper cake, then take a long look at our Baby Diaper Cake Picture Gallery for some more unique diaper cake ideas. Are YOU thinking about creating your own diaper cake, but don't know where to start? Here are detailed diaper cake instructions that make it easy!